In the springtime, tender berries and winter-killed animal carcasses draw bears. In mid-fall they gorge on falling acorns. But in late summer and early autumn, nothing attracts bears like a tall cornfield with ripe yellow corn. In the springtime, tender berries and winter killed animal carcasses draw bears. In mid-fall they gorge on falling acorns. But in late summer and early autumn, nothing attracts bears like a tall cornfield with ripe yellow corn. The high-fat carbohydrate is just what they need before hibernating. The tall stalks also provide security cover, enticing them out of nearby woods to feed during legal shooting hours. That offers you the perfect opportunity for an afternoon hunt. Here’s how to set up the perfect cornfield bear ambush. Locate the best bear hunting areas. Check with biologists and wardens for locations where bears are most plentiful. Then pinpoint the most remote parts of those areas with few roads, lots of unbroken woods and some agriculture. Pinpoint the ultimate cornfield. Farmers can often tip you off to where bears are damaging their crops. Every ear of corn eaten or destroyed takes money out of their pockets. If not, use legwork or an ATV to search the perimeters where cornfields edge up to remote woods, preferably hilly or mountainous. Scout for sign. You’ll definitely recognize bear damage when you see it. They’ll often tear up, knock down and roll on a 100-200 square-foot area when they feed. But they may walk in a few rows before they create such chaos. So watch for a few trampled stalks on the edge and check further in when you see such an entry point. Judge the bear’s size carefully. You don’t want to set up on a sow and cub. Make sure there’s only one size paw print. It should be a minimum 4.5 inches across, indicating a 5.5 to 6-foot square bear — likely a boar. Scour the area looking for large dropping piles. The bigger they are, the bigger the bear likely is. Look for a pile half the size of a loaf of bread and you’re onto a 300-pound-plus animal. Measure clawed tree sign. 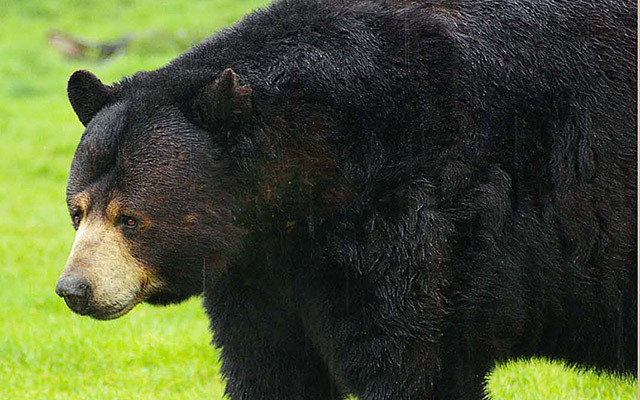 Often bears will claw trees before entering a corn field, marking the territory to show who is boss by their scent and the height of their marks. Look for scratched bark up to 7 feet high. Determine where they’re entering the field. If they’re not disturbed, bears will tend to follow the same trail. It may wind through open timber as they leave their bed on a knoll or ridge or in a swampy area, but as they approach the corn, bears like some cover for security. Look for shrubs, greenbrier and low brush on the edge of the field that’s mashed down where they entered. Backtrack and set up. Once you find the entry point, follow the bear’s trail back until you locate a good downwind tree for a stand or use brush to camouflage a blind. Don’t go too far towards his bedding area or you may push him out. Set up near the cornfield if bears have been seen in daylight and the weather is cool. If the weather is hot and muggy with little daytime activity, hunt at least 150 yards back along the bruin’s trail. Of course your quarry may not follow this routine every day. But with about a four day hunting effort, this cornfield game plan is almost sure to provide a plush, glossy rug and freezer full of tender bear steaks, roasts and burger.